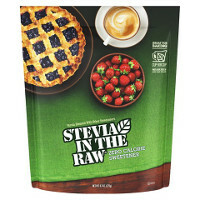 Enjoy your sweet moments with Stevia In The Raw, a naturally sourced, zero calorie sweetener. The delicious sweetness comes from the sweet leaf of the stevia plant. The delightful taste measures cup for cup, just like sugar. Cut the calories in all your favorite recipes.